I repaired this Seth Thomas No. 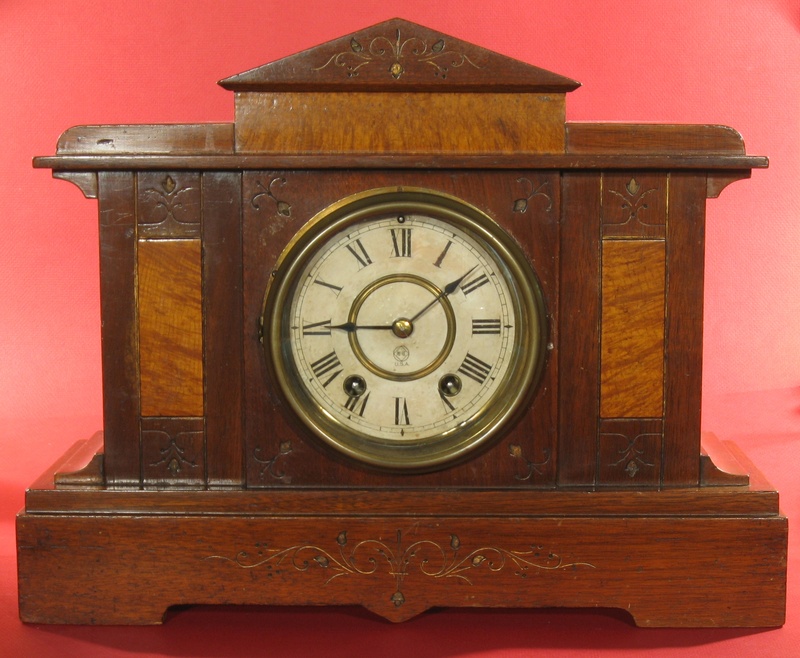 801 mantel clock. The date June 1889 is on the back door (date code 9881F). Oak case with French walnut veneers. The movement is round with loop end mainsprings. It is the forerunner of the Seth Thomas No. 120 movement. Repair job 6309. This movement has run for many years. The escape wheel teeth were worn too short, and the pallets had grooves worn in them. After some thinking and some luck, I came upon an effective repair method: The pallets are the same as those in the No. 120 and No. 124 movements. The escape wheel teeth are the same also (the wheel spokes are different, but that doesn’t matter). The arbors are different, and they are mounted in the opposite direction. I bought an old No. 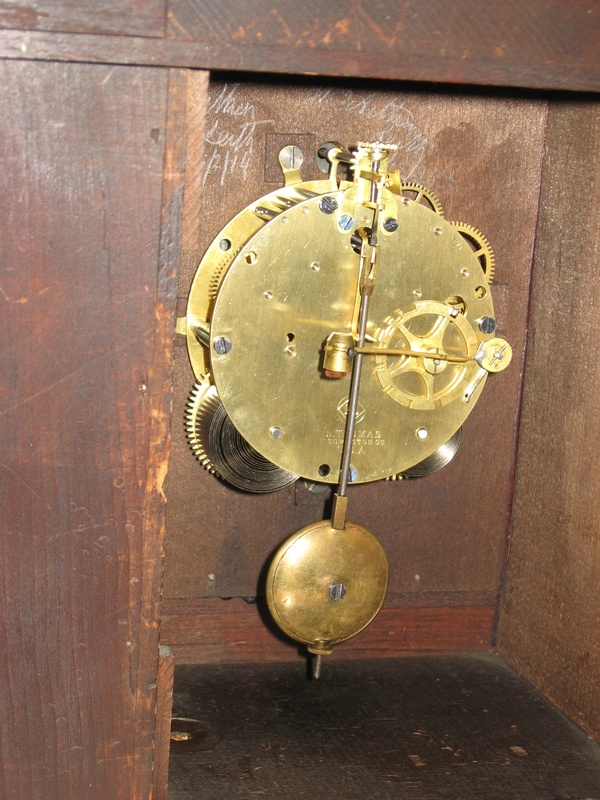 124 movement, removed the pallets and escape wheel from their arbors, and mounted them on the arbors of this clock. 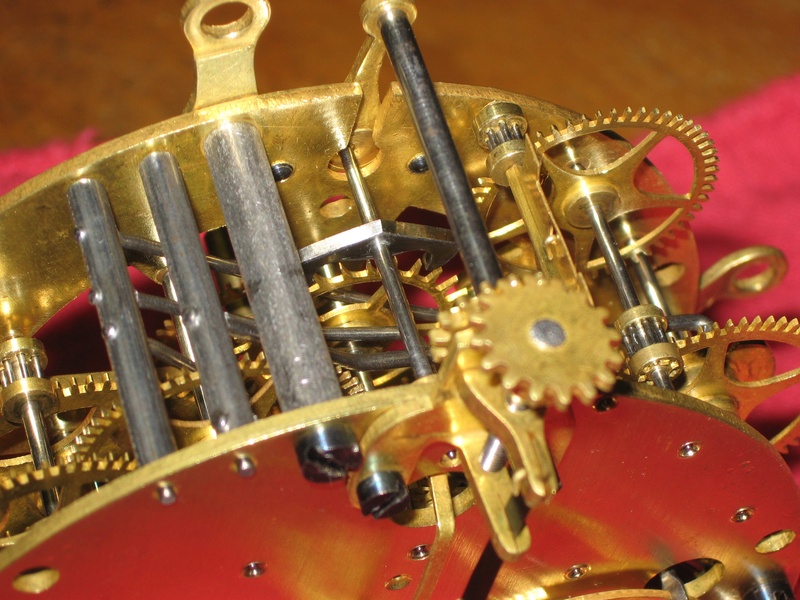 After setting the pallet depth, the escapement worked like new! (Another repair technique would have been to make new pallets and escape wheel, which would have been time consuming (and very expensive to my customer). I also polished the pivots and installed 7 bushings. Reference: Seth Thomas Clocks and Movements, by Tran Duy Ly. That looks like a very nice clock. After viewing the video, I have some questions about my Seth Thomas candlestick clock that I will ask you about.